When the battery is connected to the load, the discharging process takes place in which the sulphuric acid in the electrolyte combines with the active material on the plate. This releases energy and the plate material is converted into lead sulphate. Both the active materials on the negative and positive plates become lead sulphate. During this chemical reaction, hydrogen atoms in the sulphuric acid combine with oxygen to form water. As a result, positive plates release electrons and the negative plates accept equal number of electrons. This creates a potential difference between the positive and negative plates. This reaction is heavy only if the battery is discharged through the load. Lead acid batteries can be classified into two types namely Starting or Cranking battery and Deep cycle battery. The starting battery is known as SLI battery (Starting Light Ignition) and it is designed to give a heavy current to start a load such as engine. These have more number of plates and the plates are thin. Deep cycle battery on the other hand has thick plates and is designed for a number of discharge cycles. The voltage within the battery depends on the number of cells. Each cell consists of two plates which generates 2 volts. The electrolyte in the battery is sulphuric acid- water mixture and has the specific gravity which is the weight of the sulphuric acid- water mixture compared to equal volume of water. Pure water has a specific gravity 1. A lead acid battery is composed of array of cells. This array of cells is known as Battery. A 12 volt Mono block battery has 6 cells (each gives 2 volts) but a 2 volt tubular battery has only one cell. The capacity of the battery to store charge is expressed in terms of Ampere hours (Ah). One Ah = 3600 coulombs. 1 Ah battery can provide 1 ampere current in 1 hour. The 100 Ah tubular battery used in Inverters can give 1 ampere current for 100 hours. Battery rating is based on the constant discharge rate for a particular time; say 10 hours, till the terminal voltage reduces to minimum. Typically a 100 Ah battery gives 5 ampere discharging current for 20 hours. During charging, the energy from the external power source causes the chemical changes in a reverse manner so that battery regains its charge. One complete discharge and recharge forms a battery cycle. This cycle is usually a discharge from 100 % to 20 % change followed by recharging from 20 % to100 %. Life of the battery depends on the number of deep cycles per day. For example, if a battery is discharged 50 % per day and recharged to 100 %, its life increase to twice than a battery discharging and recharging occasionally. Therefore it is better to discharge and recharge emergency lamp battery and inverter battery daily to increase its life. It is also better to start vehicles daily even if it is not running. This prevents self discharge and increases the efficiency for cycling. If the lead acid battery is not discharging through the load, self discharge takes place @ 4 % per week at 27 degree. For example, a 125 Ah battery shows self discharge @ 5 Amps current per week if it is not discharging through the Inverter. All the cells in the battery will not be equally good due to aging. The aging process starts at the moment the battery leaves the manufacturing factory. Some cells accept charge very fast and some in a slow rate. If this happens, the battery will not hold sufficient charge and will discharge very fast through the load. To prevent this and to charge all the cells equally, the equalization method is used. Equalization is done by giving slight overcharge to the battery even after the terminal voltage rises to maximum. Due to this overcharging, the weaker cells also get time to accept full charge. A fully charged 12 volt lead acid battery will show 13.8 V terminal voltage and a 12 V tubular battery will show 14.8 V in the fully charged state. Lead acid battery can be discharged either at a slow rate for long time or at a high current for a short period. For example, a 10Ah lead acid battery can be discharged at 0.1C rate and will give 1 Amps current for 10 hours. If the same battery is discharging at 1C, it gives 10 Amps current for 1 hour only. The discharge rate is linear on low loads. When the load increases, this linear relationships losses and the battery suffers internal loss of energy and heats up. This is the most important factor affecting battery efficiency. The lead sulphate accumulating on the plates prevents charge release/ acceptance cycles. Usually the lead sulphate crystals will be removed during water filling and charging. So it is better to charge the battery as soon as possible to prevent sulphation. Always keep the normal water level by adding distilled water or de- ionized water. Tap water contains minerals which may alter the electrolyte chemistry. One or more of the following reasons can cause a premature battery breakdown. 2. Capacity loss- due to sulphation, improper charging, dry battery etc. This is a dangerous situation due to one of the following reasons. If the battery plates are shorted, the energy will be released quickly. Shock on the old battery plates break them and short each other. This causes electrolyte boiling and explosion. When the battery is overcharged, the charge voltage increases above the Gassing voltage. This causes formation of excess hydrogen. The Gassing voltage of a 12 V lead acid battery is 14.3 at room temperature. 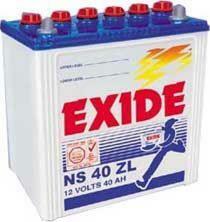 The battery voltage crosses the gassing voltage level if one or more cells are damaged or weaker. The weaker cell will charge last since its resistance is lower than the good cells. So higher voltage appears across the good cells and may increase the voltage above the gassing voltage level. The hydrogen produced due to this will recombine in the sealed batteries but sometimes escape in flooded lead acid batteries leading to fire and explosion if there is any spark. 1. Always charge the battery with caps in space. 2. Always fill the battery with distilled water before charging. This reduces the space for the accumulation of gas. 3. Place a wet cloth over the caps before charging. This prevents the chance of fire get in to the battery if there is a shorting in the terminals. 4. Do not keep any inflammable gas or liquid near the battery. 5. The charger should be connected to the AC socket only after it is connected to the battery terminals. This prevents sparking in the terminals. 6. Do not place any metal objects over the battery to prevent terminal shorting. 7. Always disconnect the negative terminal first. 8. Rock the charger clips to the terminals to remove any corroded material. If there is any corroded material, it may creates high resistance that results in terminal heating or reduce the flow of charge. 9. Do not use Bangles or Metal wearing when handling the battery charger. A shorting can burn your hands. 10. Always use a Transformer based charger. Remove the clips only after removing the AC plug.